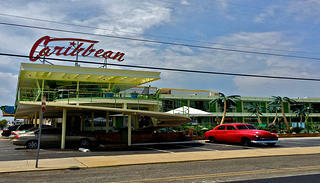 Wildwood’s iconic and photogenic Caribbean Motel was the perfect location to host a gathering of vintage-loving guests. 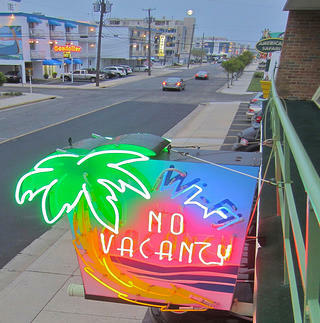 Retro Roadmap hosted the first of what is hoped to be more Vintage Weekends, showcasing the mid-century motels and more of the shore town of Wildwood, New Jersey with a sold-out crowd attending from up and down the East Coast. From the base camp at the iconic Caribbean Motel (built in 1957 by Lou Morey and listed on the National Register of Historic Places), the tiki-themed event combined vintage-inspired activities with modern social media sharing to increase awareness of and interest in the many facets of 1950s and ‘60s culture that still exist in this popular beach town. The Vintage Weekend filled the vintage motel to capacity during the shoulder season, giving a boost to the local economy at the same time. “We were sold out within a week,” says Caribbean owner Carolyn Emigh, who along with her partner George Miller purchased the seasonal motel in 2004 and restored it to its 1950s-era glory and then some. 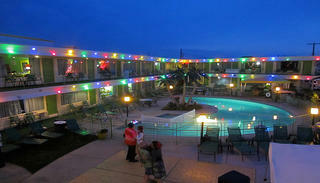 (Caribbean Motel is also a Historic Hotel of America.) Many guests were first-time visitors to Wildwood, but before the weekend was even over, were already planning to return -- and bring friends! 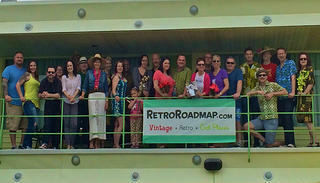 A happy crowd commemorates the inaugural Retro Roadmap Vintage “Tiki” Weekend in Wildwood, New Jersey. Partnering with the Doo Wop Preservation League, the weekend kicked off with a Nighttime Neon Bus tour. Two school buses filled with guests attired in vintage and “tiki” attire (a nod to the theme of the weekend) traversed the island at dusk oohing and aahing at the glowing vintage neon signs that line the avenues, while learning about the history of the island from volunteer guides. Vintage weekenders had fun scouring the island, capturing selfies and snapshots for the Social Media Scavenger Hunt. A Social Media Scavenger Hunt was a hit with guests receiving clues, “collecting” places by snapping a photo (and selfie or two), and posting on Instagram or Facebook with the #vintagewildwoodweekend hashtag. 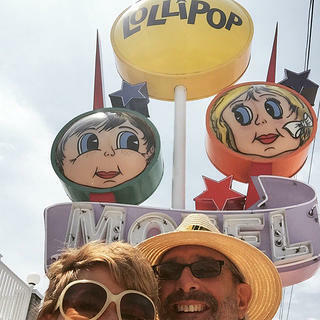 Not only was this a fun excuse to explore the island, the hashtagging and comments on photos on Instagram, Facebook, and Twitter raised the profile of Wildwood’s retro charm with a much wider audience beyond those in attendance. 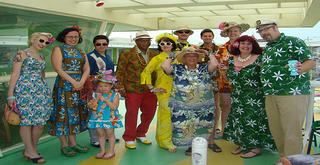 The tiki theme popular in the mid-century made for a colorful and creative vintage fashion show on the Lapidus-inspired walkway. There was also a hefty dose of earlier-era-inspired fun, including a vintage/tiki fashion show with participants walking down the Caribbean’s Morris Lapidus-inspired “levitating ramp,” accompanied by strains of 1950s/60s era music wafting through the air. As dusk settled in, a lively game of shuffleboard broke out, and there was plenty of dancing underneath the famous Wildwood plastic palm trees. Dancing under the colorful lights and plastic palm trees that Wildwood is famous for. The immediate sold-out response, positive feedback from guests, and jealous comments left on Facebook posts about the weekend show that there is an audience and interest for this type of vintage-themed weekend. Not only are they fun for participants, but they also reinforce to owners of these properties that people will travel a distance and pay for the opportunity to stay in authentic locations from a bygone era. That win-win situation means keep your eyes peeled for Vintage Wildwood Weekend #2 in 2016!